From AIS Bulletin #241 April 1981 Introducing DAWN CARESS. AB (l/2), 24" (61 cm), EM. 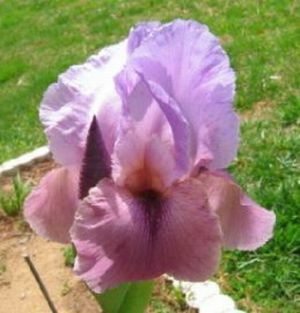 Large, well-proportioned arilbred of medium pale lilac with subdued bronze-lilac beard. Standards wide, full and cupped. Falls also wide and nicely semi-recurved. Large flower. Bud count 4-5. Vigorous and distinctive. Esther, the Queen x Tuesday Song. HC '80. $20.00. Les Peterson.